Penelitian - With scarce nutrients and weak gravity, growing potatoes on the Moon or on other planets seems unimaginable. But the plant hormone strigolactone could make it possible, plant biologists from the University of Zurich have shown. The hormone supports the symbiosis between fungi and plant roots, thus encouraging plants' growth, even under the challenging conditions found in space. The idea has been bounced around for a while now, and not just by the likes of NASA, but also by private entrepreneurs such as Jeff Bezos and Elon Musk: that of one day establishing colonies for people to live on the Moon or on other planets. Such visions, as well as the prospect of long-term human space expeditions in the future, raise the question of how to sustainably provide food for the people in space. One possible answer is to cultivate crops in situ. However, the soils on the Moon and on other planets are surely lower in nutrients compared to our agricultural land. The alternative, transporting nutrient-rich soil and fertilizers up into space, comes with a high economic and ecological cost. When looking for a possible solution, the research group working with Lorenzo Borghi of the University of Zurich and Marcel Egli of the Lucerne University of Applied Sciences and Arts concentrated on the process of mycorrhiza, a symbiotic association between fungi and plant roots. In this symbiosis, the fungal hyphae supply the plant roots with additional water, nitrogen, phosphates and trace elements from the ground. In return they get access to sugar and fat produced by the plant. This symbiosis is stimulated by hormones of the strigolactone family, which most plants secrete into the soil around their roots. The process of mycorrhization can greatly increase plant growth and thereby substantially improve crop yields - especially in soil that is low in nutrients. In space, cultivated plants would not just have to contend with low-nutrient soil, but also with conditions of microgravity, i.e. almost zero gravity. In order to investigate the influence of such an environment on plant growth, the researchers cultivated petunias and mycorrhizal fungi under simulated low gravity conditions. Petunias provide a model organism for plants of the nightshade family (Solanaceae), which include for example tomatoes, potatoes and eggplants. The experiments revealed that microgravity hindered the mycorrhization and thus reduced the petunias' uptake of nutrients from the soil. But the plant hormone strigolactone can counteract this negative effect. Plants that secreted high levels of strigolactone and fungi which the researchers had treated with a synthetic strigolactone hormone were able to thrive in the low-nutrient soil despite the microgravity conditions. "In order to get crops such as tomatoes and potatoes to grow in the challenging conditions of space, it is necessary to encourage the formation of mycorrhiza," summarizes Lorenzo Borghi. "This seems to be possible using the strigolactone hormone. 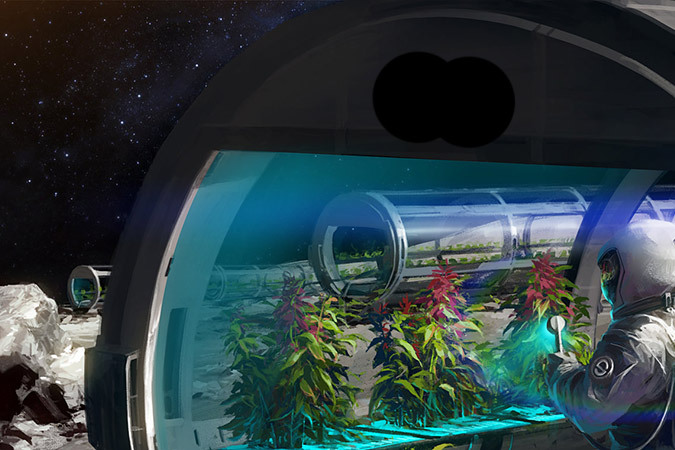 Our findings may therefore pave the way for the successful cultivation in space of the types of plants that we grow on Earth," Borghi says.